Auto-Renew (also known as automatic renewal or AutoRenew) is a service offered by Trend Micro via its authorised online retailer, Digital River (Digital River Ireland, Ltd. is the authorised reseller and merchant of the products and services offered within the store). For your convenience, it is designed to automatically extend your subscription right before it is due to expire – meaning you do not have to manually renew your subscription. Extremely easy to use and very informative updates and reporting of web threats, very satisfied with the security protection as my computers installed with Trend Micro have been running smoothly with no compromising in security. Trend Micro has been providing me total security for my PCs for many years, I never really need to do anything as everything has been well thought for and this awesome software runs in the background silently keeping you updates of your system condition without affecting my gaming performance. I had been using Trend Micro since 2010 and I did not regret using it. It is getting better. Easy of setup and good user interface. IDuring May and June 2016 AV Test continuously evaluated 22 home user security products using their default settings. Trend Micro Internet Security HAS constantly achieve top score in protection, performance and usability. AV Test focused on realistic test scenarios and challenged the products against real-world threats. "The winner in our testing was Trend Micro Premium Security, which has one of the best overall packages for building a defense-in-depth across multiple devices. It was one of only two packages to catch 100% of exploits, with no false positives. And it has an easy to use interface, a quick install process, and a huge maintenance suite of helpful programs." "Speedy antivirus scan. Excellent score in malicious URL blocking test. Very good phishing protection. Powerful and flexible backup/sync system. Secure vault for sensitive files. Supports Windows, Mac, Android, iOS. Better mobile support than most competitors'. Many bonus features." 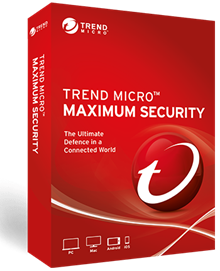 Trend Micro Titanium Maximum Security 2014 stands out for being an all-in-one security suite. It offers the usual antivirus and anti-malware protection, plus a mobile security component, 5GB of free online backup, and password and online-banking security. In AV-Test’s real-world (zero-day) tests, Trend Micro successfully blocked 100 percent of unknown malware attacks. Not compatible with Kindle Paperwhite and Amazon Fire Phone. *Free gift is subject to availability and may be replaced with another item without advance notice.